Stepping down from the early evening train. Back in the provinces after a hard day in Paris. Back in my small town. Here I am, feeling out of place on the platform in my city apparel. Just being here though, after the Parisian mayhem, I feel that I have already slipped into something more comfortable. I suppose that’s the whole thing about small town living – you eventually slip into it like you might an old pair of jeans, a reassuring though somewhat outdated second skin. Of course though, I wasn’t born here. I’ve grown into the town rather than grow up with it. On a daily basis, I meet locals who loathe the place. The complaints are always the same : the town is too small, there’s nothing to do, everything is « rubbish » and it’ s always better elsewhere. That however, is the best way to appreciate small town life, you have to move away first, before coming « home ». Home to me for the past twenty five years has been the town of Bourges. It would actually be wrong to call it a small town though. In population terms there are 70,000 of us, so that makes Bourges a big small town or even a small big town. It is just small enough for everyone to know everyone else, without relations being too incestuous, yet, it is big enough to retain some degree of anonymity. I know plenty people in Bourges and there are thousands that I have never met. In size terms therefore, I would say that Bourges is just about the right size. On a good day, nowhere is more than a five minute drive from anywhere else, yet, during the local « rush hour » it can take up to half an hour to drive across town. It’s a good town for cyclists, from the farthest flung edge of the city limits to the very heart, it is a leisurley ten minute pedal. Now, be it small big or even big small, it is possible to lose contact with others. The wife often says to me – « oh I met an old school friend today who I haven’t seen for nearly twenty years. » And you find that the school friend in question has actually never left town, he or she just lives on the other side of town. Yes, it is a small town, but like in all towns, you never go to those parts where you don’t need to go, even if they are only a few minutes drive away. Come to think of it, I can’t remember the last time I went to the North of Bourges. In the last year, I’ve actually been more to Paris than I have to the other side of town. 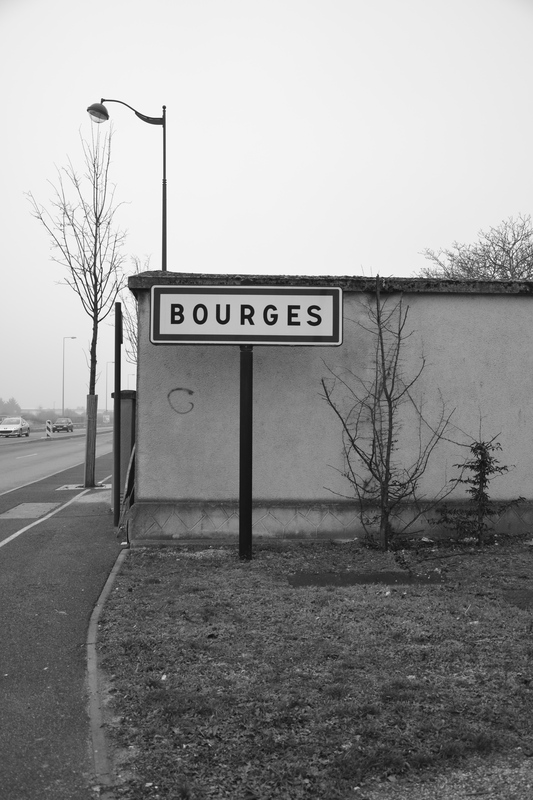 Bourges has a North/South divide. The railway line cuts the twon into what could be called the « right and wrong side » of the tracks. The north of town has the prison, and the big housing estates. The south of town is all « suburban ». Now, we have to put this in context. For those who have never been anywhere much, the north of Bourges is considered almost as a « no go » area, bristling with deliquants, drug dealers, gangs of ferral youths and immigrants. This is the place you’re sure to get mugged or have your car torched – as happens on quite a few of the vast social housing estates around Paris or Marseilles. This is not Paris though, and you have to put things in perspective. We don’t have drive-by shootings as in Marseilles, we don’t get riots. This is the town, where a stolen scooter, a burglary or a drunken Saturday night brawl between a couple of binge-drunk youths, makes for some serious column inches in the local paper. Of course, living here for twenty five years, you begin to develop small town reflexes, attitudes and even (dare I say it) -) certain prejuducial views. Yes, I have acquired the full set of small town fears. The greatest fear being that my small town is now exactly like everywhere else. Scratch the surface of that « second skin » I was talking about though, and you find that this small town always has been like everywhere else. As for préjudice … well, us small towners don’t like big city types, especially Parisians, with their airs and graces and sensé of superiority. They look down on us provincial types. We’re just all peasants.